The April issue of Harper's features a long, thoughtful, and very funny article about raw milk. Like Sona Pai's Culinate exploration of the health risks and benefits of unpasteurized milk, the Harper's piece tries to assess the pros and the cons of drinking dairy straight, more or less, from the cow. It concludes with the author, Nathanael Johnson, downing a farm-fresh glass of raw stuff — and, unlike Culinate blogger Cindy Burke, feeling just fine afterward. Johnson doesn't present any definite answers to the question of whether raw milk is good or bad, because science doesn't really have any. 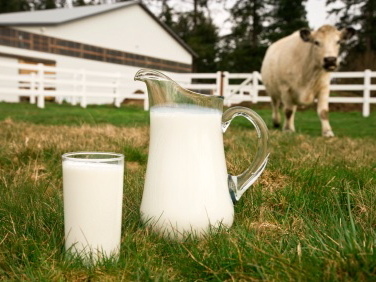 Yes, even the cleanest, freshest raw milk by definition has bacteria in it. (And yes, the milk of dirty cows kept in industrial conditions will certainly have dangerous bacteria in it.) What interests Johnson — and all the raw-milk devotees who swear by the stuff for preventing or curing allergies and boosting immunity — is whether or not the bacteria naturally present in raw milk is not only good for us but necessary. "Perhaps," he asks, "we've become too clean and aren't being exposed to the bacteria we need to prime our immune systems." Babies, of course, get such priming in the form of breast milk. Can cow's milk do the same for us, post-babyhood? As Johnson points out toward the end of his article, not everybody's ancestors herded dairy animals and evolved to digest fresh milk as adults. For the lactose-intolerant, as Catherine Bennett-Dunster has noted on Culinate, there are plenty of other foods to eat besides milk that are rich in probiotics, or beneficial bacteria. Cow's milk isn't the only source of the good stuff. bq. Advertisers promise that consumers can have the healthiest possible food from happy animals in idyllic settings at current prices. This obviously is a lie, but it's a lie that most people accept. Although American consumers are periodically outraged by the realities of modern agriculture, they never stop demanding cheaper food. Given our recent national sticker shock over rising food costs, it's refreshing to be reminded that real food should have a living-wage dollar value as well as taste and quality value. Yes, good food should be affordable for everyone. But only when enough of us demand good food all the time will it become the norm — and, perhaps, even cheaper than the subsidized industrial stuff that advertises itself as "cheap."